1 "Ribbit." "Ribbit." Hop. Hop. Look! It's a frog! 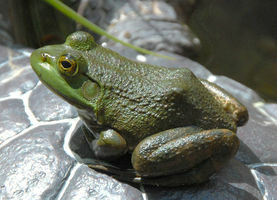 Frogs are small animals that can sometimes be found near water. Frogs are good jumpers. They have long legs. Their legs help them jump on land and swim in the water. Many people like frogs because they catch bugs like flies or mosquitoes. 2 Some frogs are called toads. Toads are a kind of frog that can spend most of its time out of the water. Toads have dry skin. Some toads have bumpy skin that looks like warts. Frogs have smooth, wet skin. Some people say that it feels slippery or slimy. Frogs spend more time in the water because they have to keep their skin wet.